EXCELLENT INCENTIVES ARE BEING OFFERED ON RESERVATIONS TAKEN BY THE END OF JANUARY 2019, TO INCLUDE; CONTRIBUTION TO LEGAL FEES, FLOORING CONTRIBUTION, CHOICE OF TILES, AND CHOICE OF KITCHEN. FURTHER DETAILS ARE AVAILABLE FROM THE AGENTS. THE MOUNT is a stunning apartment development of only FOURTEEN LUXURY APARTMENTS, to be constructed to the highest quality and standards so as to maintain the luxurious brand that Pillars Holdings, the developers, are known for. 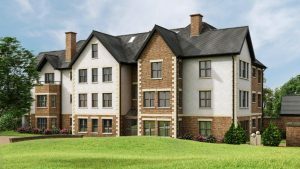 The Mount is positioned in one of the most sought-after parts of Ashbourne, giving accessibility and convenience to future residents with easy access afforded to local shops, restaurants, and major road networks.